Last week BBM announced this year's edition of the Dragons team set. This is a pack based set containing 99 regular cards, 9 insert cards (DRAGONHEART) and various autograph/jersey cards. The regular cards contain 78 cards of the players, coaches and manager; a checklist card; two cards highlighting rookies and six three card subsets featuring players grouped by a common theme - "sophisticated expectations", "dependable veteran", "starting pitchers", "winning formula", "central player" and "scorer". The set will be released in mid-June. BBM released a set last December to celebrate the Chunichi Dragons' 75th Anniversary. 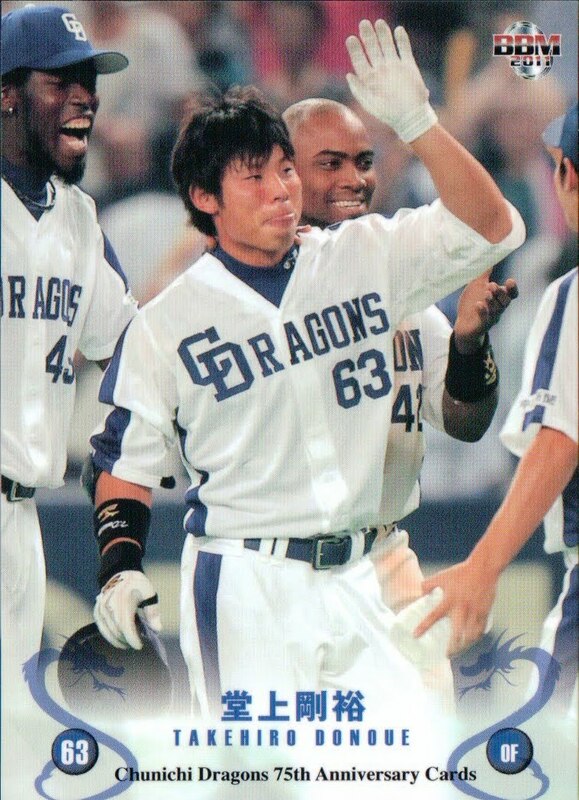 The set pretty much follows the standard pattern most of BBM's Anniversary sets have followed - there's a six card "History Of Dragons" subset, 75 cards for OB Dragons (which as usual means both retired players as well as active former Dragons) and 18 cards for the 2010 team. 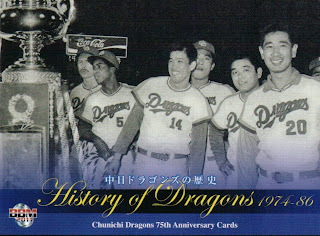 Each of the six "History Of Dragons" cards covers an 11 to 13 year span in the team's history. The cards depict memorable events such as the 1954 and 2007 Nippon Series victories and the 1974 and 1988 Central League pennants. BBM did a set to celebrate the Dragon's 70th Anniversary five years ago and, as you'd expect, there's a bunch of overlap with the OB players. 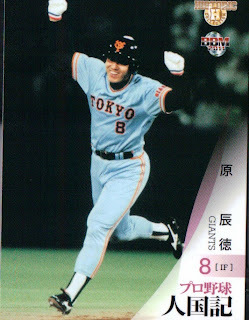 In fact, there's at least one player (Shozo Eto) who has the same picture used in both sets. 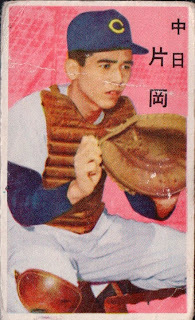 The previous set contained no gaijin in its OB players. This one has a number including Ken Macha, Gene Martin, Leo Gomez and Tyrone Woods. Again as is usual for the Anniversary sets, there seem to be more players from the 60's and 70's on than from earlier years, although there are several players from the 40's and 50's. The set also includes two players currently playing in the US - Kosuke Fukudome and Kenshin Kawakami. 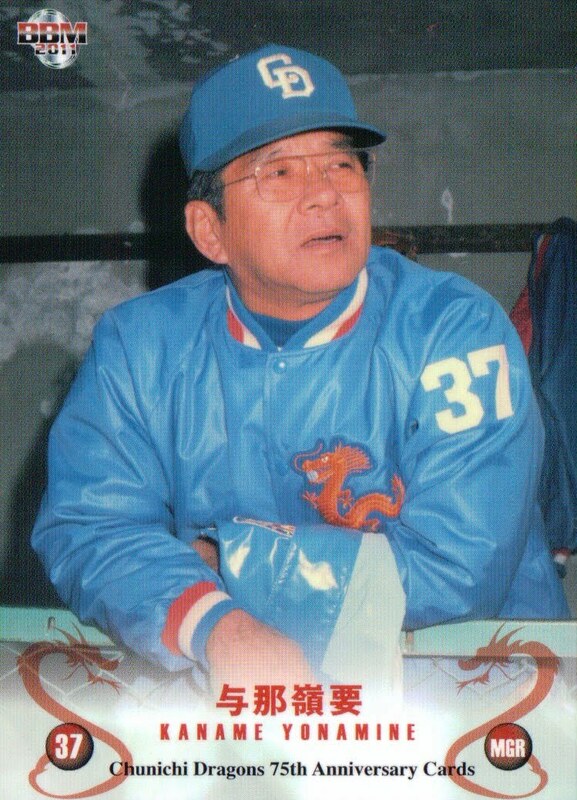 Most of the stars from Dragons' history are included - Michio Nishizawa, Shigeru Sugishita, Morimichi Takagi, Kenichi Yazawa, Kazuyoshi Tatsunami, Hiromitsui Ochiai and Shinichi Eto. The most prominent missing player is Senichi Hoshino, who was also missing from the 70th Anniversary set. 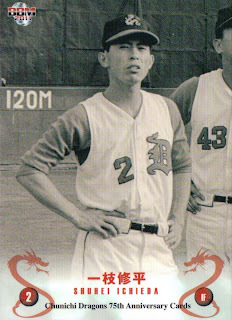 He is however clearly visible on the "History Of Dragons" card for the 1974 Central League champs as well as findable on the card for the 1988 champs. 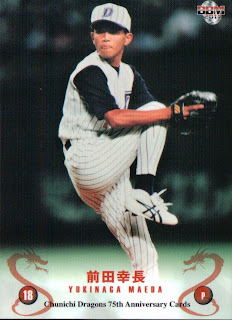 The 18 cards for the current team include Masa Yamamoto, Masahiko Morino, Kazuhiro Wada, Motonobu Tanishige and Hirokazu Ibata among others. The only card that really stood out to me was the one featuring Kazuki Yoshimi, as he is wearing a throwback uniform on it. BBM announced five new team sets last week - the BayStars, Carp, Giants, Lions and Tigers. 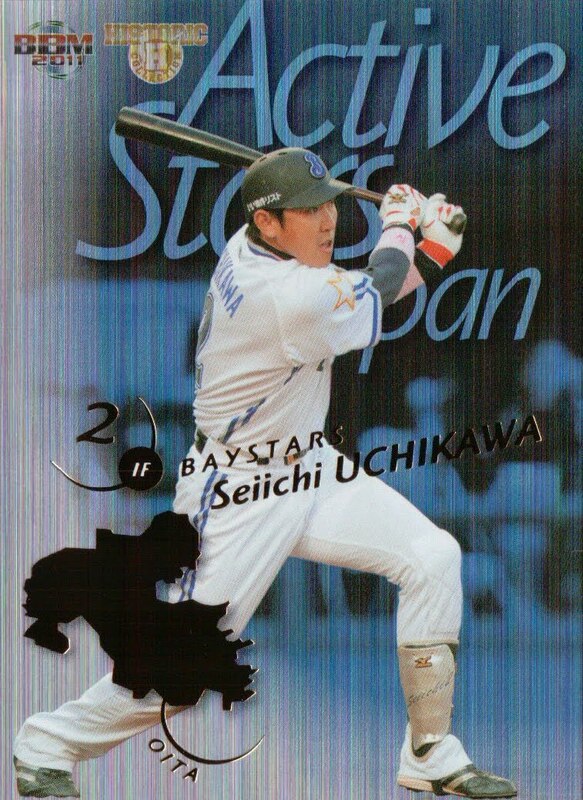 The BayStars set has 99 cards - 71 "regular" cards for the players, manager and coaches, nine "Triple Stars" cards, a six card "Newcomers" subset, a three card subset that Google translate is labeling "Hama most stars", a nine card puzzle subset and a checklist card. There's also a nine card insert set called "Spirit" and the usual autograph and jersey cards. It will be released in late April. The Carp set also features 99 cards. 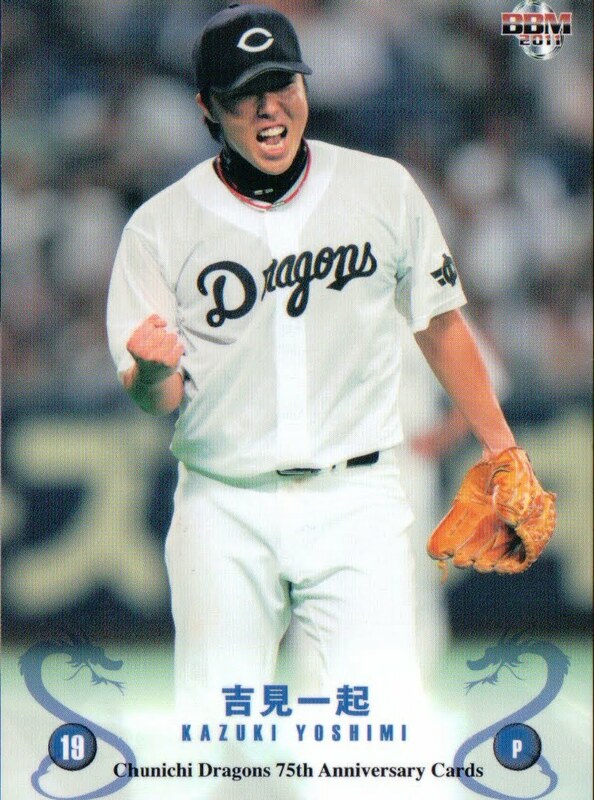 There will be 77 cards for the players, manager and coaching staff along with a six card subset called "SUPERCATCH" that is apparently dedicated to the amazing catches last season by Masato Akamatsu and Soichiro Amaya, a six card subset for "promising young players" and a nine card subset for active stat leaders. There is also a nine card insert set entitled "SOUL OF CARP" and jersey cards for Akamatsu and Amaya. I think there are also possible autograph cards. The set will be released in mid-May. The Lions set is also a 99 card set. 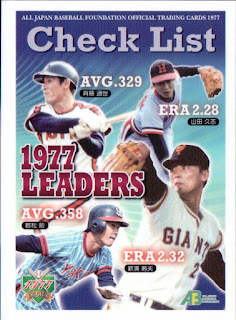 There are 71 player/manager/coach cards, 18 cards labeled "Planning Card", nine puzzle cards and one checklist card. 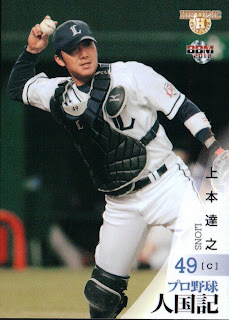 I wonder if the "Planning Card" subset is a place holder for other subsets as there are sample cards on the web page for a "History Of Uniform", "Invincible Lions" and "Combination Card" subsets (although maybe they are samples of the puzzle cards for the last two). There's a nine card insert set labeled "popular leading players" which sounds pretty generic and possible autograph and memorabilia cards. The set will be out in late May. Just to break the pattern, the Giants team set has 126 cards. There's a whopping 91 cards for players, coaches and the manager, along with a four card subset for young players, three combination cards, nine "continuous photo cards" (three three card sequences that feature sequential action shots for a player), 18 "Star Player 2011" cards and a checklist card. There are two insert sets - a nine card "Heart Beat Giants" set and a six card one just labeled as "Special" (but might be the "Super Metallic Giants" cards shown on the web page). There will also be memorabilia cards. The set will be released in late May. At 118 cards, the Tigers set is also larger than the typical team set. 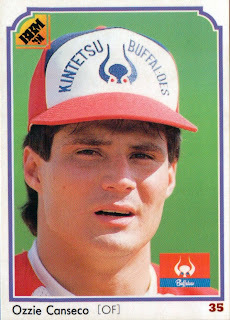 There are 84 "regular" cards for players, coaches and the manager, a checklist card, an 11 card subset for "career coaches", three cards for new Tiger players ("NEW FACE"), three cards for veteran Tiger players, six puzzle cards and nine cards featuring players in old uniforms (probably the turn back the clock uniforms they wore last summer). There are two nine card insert sets ("FANTASTIC REVOLUTION" and "SWEET SMILE") and jersey and autograph cards. The set will hit the stores in early June. 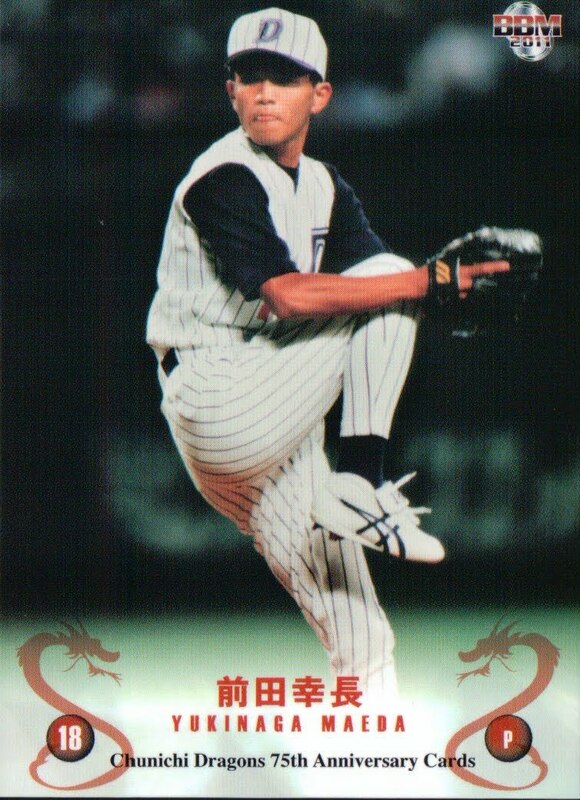 Tomoaki Kanemoto's consecutive game streak came to an end last week. 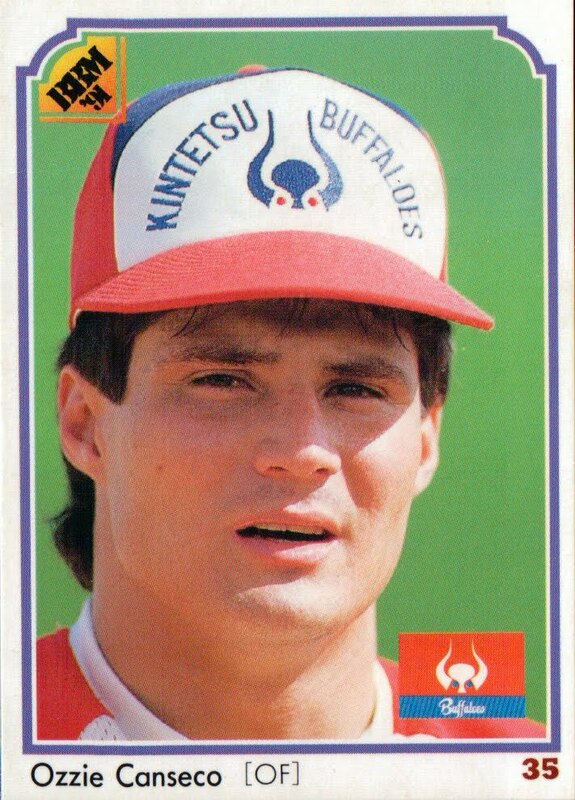 He entered the game as a pinch hitter but didn't get credit for a time at bat when a base runner was thrown out stealing to end the inning. Seems like an odd way to end a consecutive game streak - although much better than Gehrig's way (i.e. retiring due to illness that would eventually kill him). 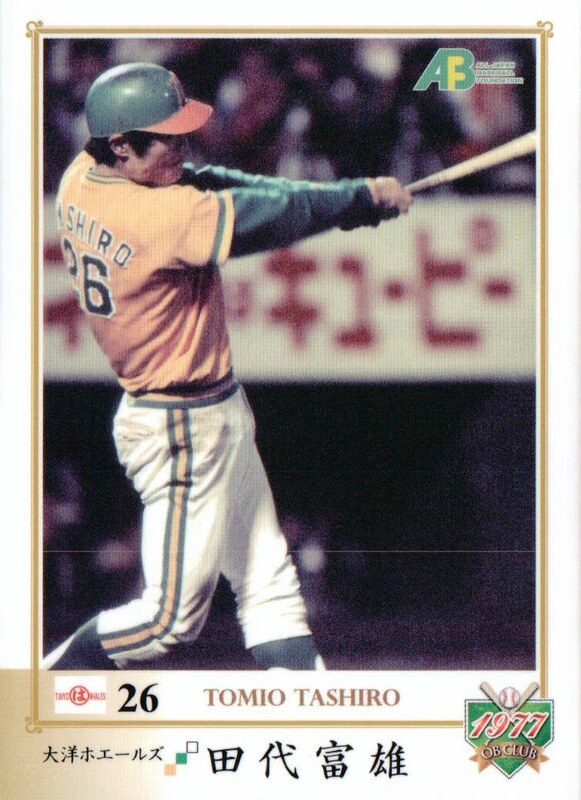 OK, apparently the 1977 set was such a success for the All Japan Baseball Foundation that they and Epoch are releasing a similar set for 1987. 1987 was the year that Sachio Kinugasa broke Lou Gehrig's consecutive game streak as well as the final year for Tokyo's Korakuen Stadium so I would expect cards for those events as well as others. The set is a box set containing 60 cards - 59 "regular" cards plus one memorabilia or parallel card. The 59 "regular" cards breaks down to 48 player cards, 10 cards for events of 1987 and a checklist card. 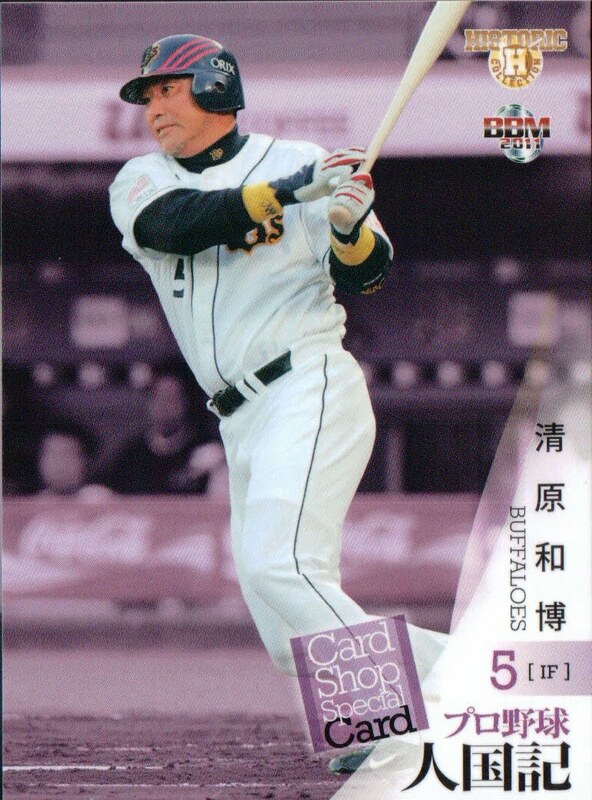 The 48 player cards might include cards for the managers of the Nippon Series teams - the Giants (Sadaharu Oh) and the Lions manager (Masahiko Mori). I think that the set was scheduled to be released in late March but I don't know if it came out on schedule. Late last year, Epoch and the All Japan Baseball Foundation put out their third set featuring OB players. As opposed to the first two sets, this set actually had a theme - the year 1977. 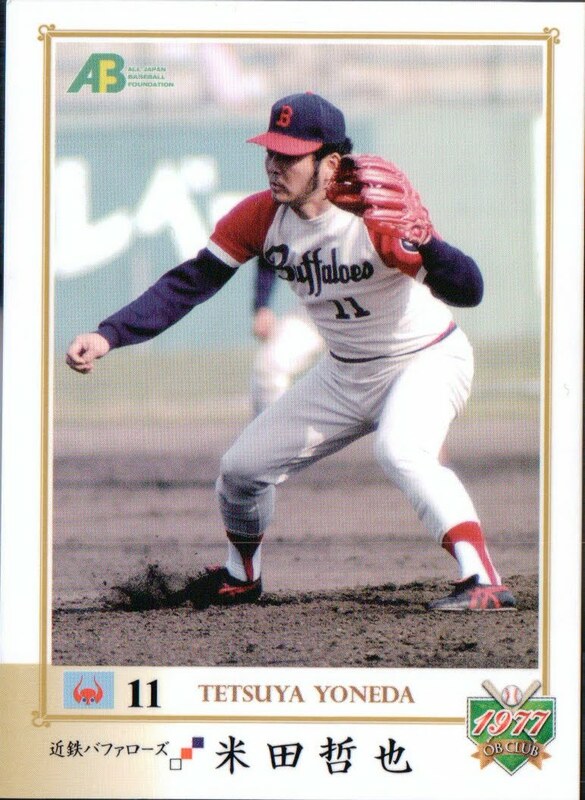 All players are shown on their cards with their 1977 teams and based on the uniforms shown, each photo could plausibly have been taken in 1977. I think that the set was issued as a box set with 64 cards - 63 "regular" cards plus an autographed card. As usual, I got an opened set, so I didn't get the autographed card. Of the 63 cards I did get, 52 of them are for individual players. 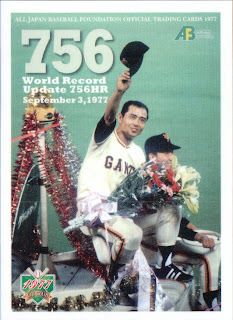 There are also 10 cards featuring significant events in 1977 - 5 cards for Sadaharu Oh's 756th home run plus cards for Keishi Suzuki's 200th win, Tetsuya Yoneda's record 949th and final game, the pennant winners (Braves and Giants), and the Nippon Series winner (Braves). 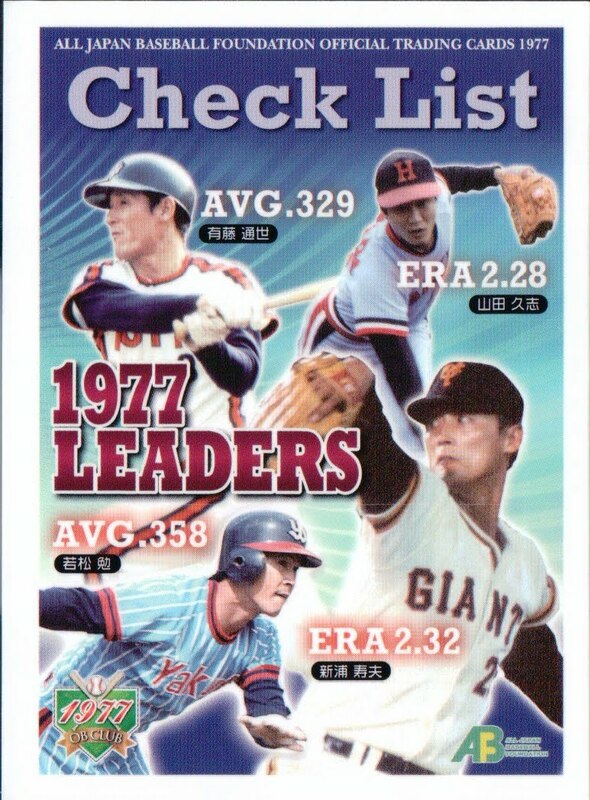 There's also a checklist card that shows the batting and ERA champs for each league. 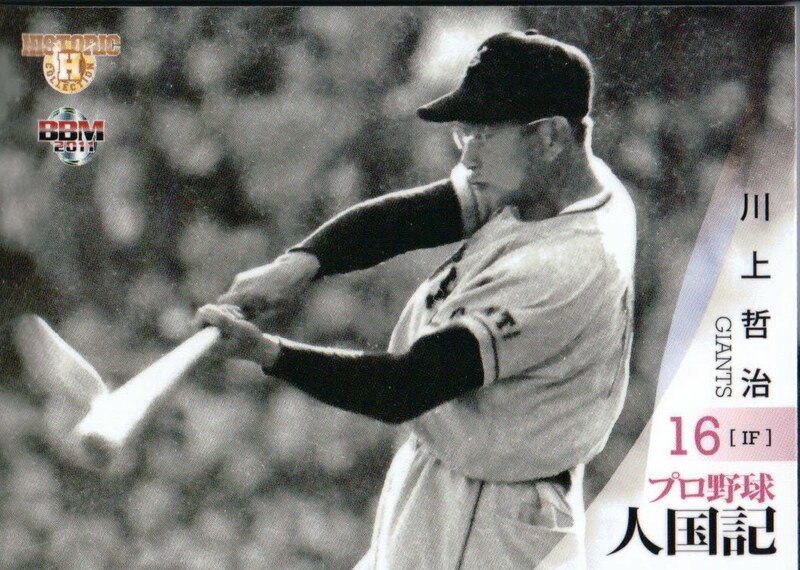 The players in the set include most the major award winners for the year - Sadaharu Oh (CL MVP), Shigeru Kobayashi (Sawamura), Akio Saitoh (CL ROY) and Hisashi Yamada (PL MVP) but not the PL ROY Yoshinori Satoh. 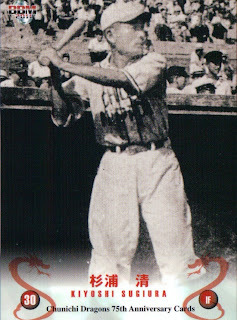 Koji Yamamoto, Shigeru Kinugasa, Isao Harimoto, Senichi Hoshino and Tsutomu Wakamatsu are some of the other players in the set. I really like this set, but there are some significant players missing who made an impact in 1977. 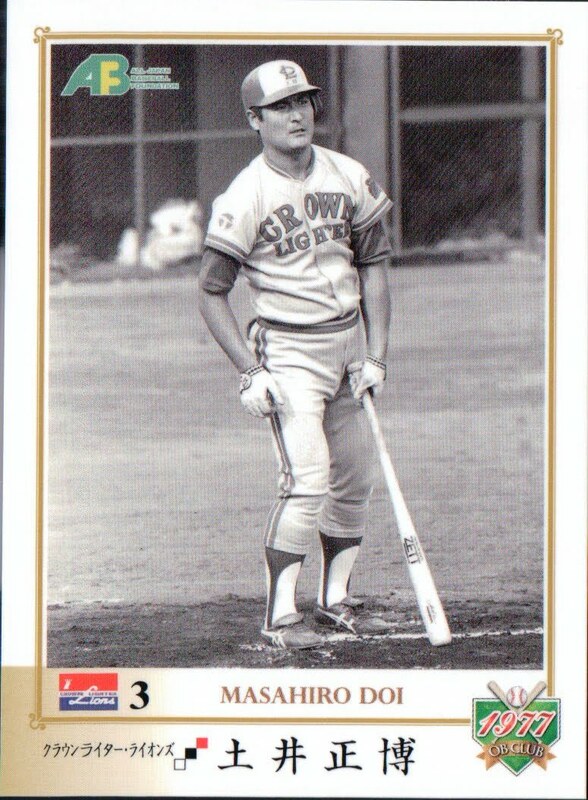 For one thing, there are no gaijin in the set, so Bobby Marcano (PL Best 9 2B), Leon Lee (PL Best 9 OF), Leron Lee (PL home run leader) and Charlie Manuel (42 home runs for the Swallows) aren't in the set. Yutaka Enatsu, Hiromitsu Kadota, Masayuki Kakefu and Yutaka Fukumoto are also notable exceptions along with (stop me if you've heard this one before) Katsuya Nomura and Choji Murata. Still, it's a nice little set and it's nice to see an OB set with a real theme. Got a couple sets in the mail the other day, so I can try to catch up a little on some of the sets that have come out in the last few months. 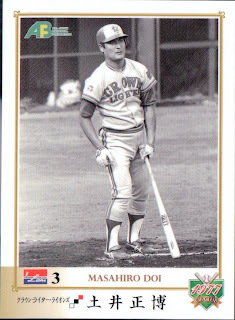 First up is BBM's first 2011 set is the 10th edition of their annual "Historic Collection" set. 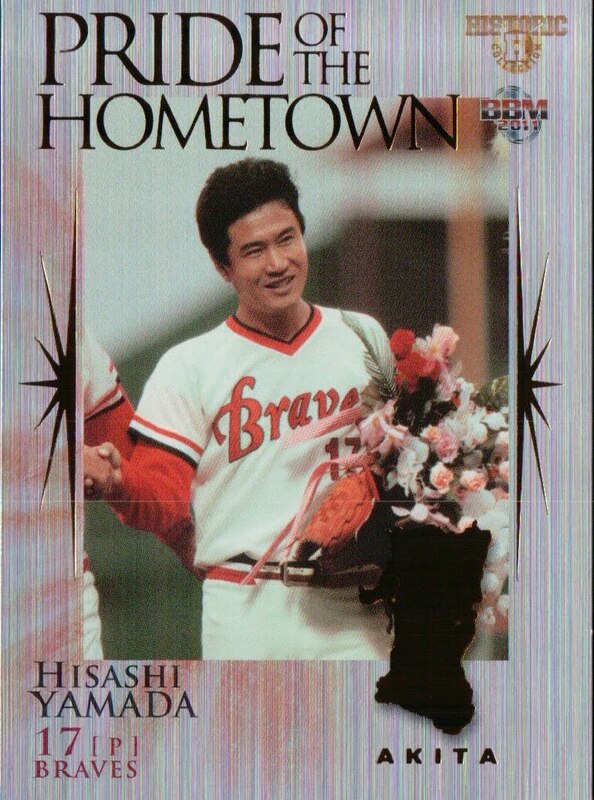 This year's set is entitled "Hometown Heroes" and it highlights players from each of Japan's 47 prefectures. As always, there are 144 cards in the set that are split evenly between OB players and active players (72 for each group). 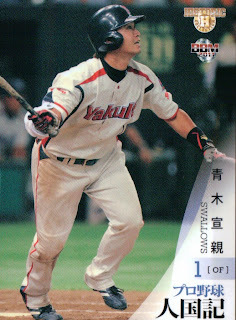 Each card has the outline of the prefecture that the player is from on the back and BBM attempted to have a least one OB and one active player from each prefecture in the set. For the active players, there are six cards per team, so BBM had to really had to juggle to get each prefecture represented. As a result, the Lions' backup catcher Tatsuyuki Uemoto ended up being in the set since he is apparently one of the few (if not the only) active player from Yamaguchi Prefecture. 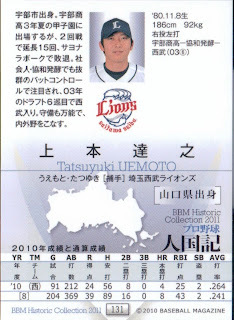 And it turns out that there are no active players (or at least there were none in 2010) from Tottori Prefecture. 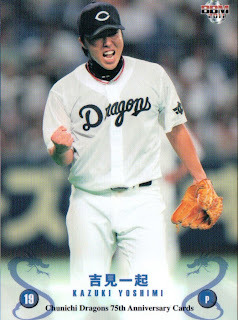 Despite these restrictions, the active players in the set includes the usual suspects - Norichika Aoki, Yu Darvish, Kenta Maeda, Hisashi Iwakuma, Michihiro Ogasawara, T-Okada and Tsuyoshi Nishioka. For obvious reasons there are no gaijin in the set. As usual, the OB players tend to be from the 1970's and later, although there's a couple older players (Tetsuharu Kawakami, Yoshio Yoshida, Shigeru Sugushita) and one from the dawn of professional baseball in Japan (Eiji Swamura). 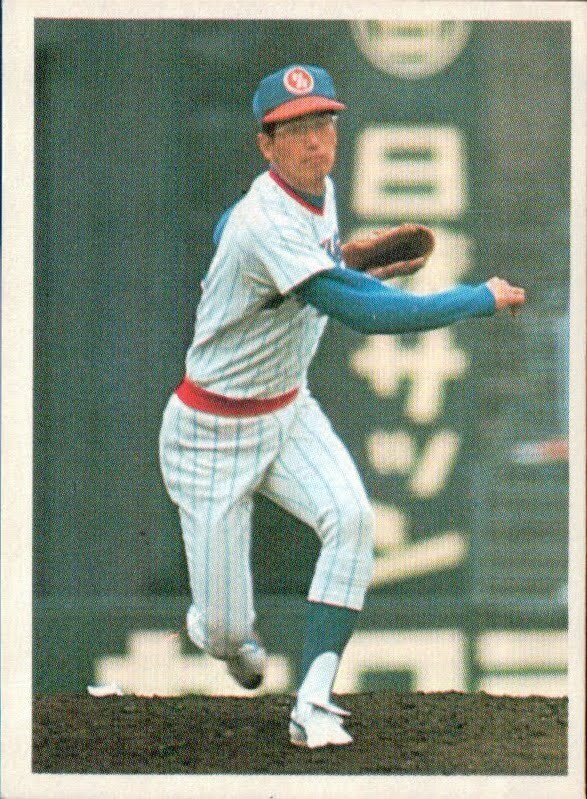 Sadaharu Oh, Shigeo Nagashima, Isao Harimoto, Koji Yamamoto, Sachio Kinugasa, and Hiromitsu Ochiai are among the other players, along with a number of players who are either currently playing in the US (Kosuke Fukudome, Hideki Matsui, Kei Igawa, Akinori Iwamura, Kenshin Kawakami) or spent a number of years in the US (Masato Yoshii, Kazuhiro Sasaki). (Keep in mind that the set was released in November, so it reflects where player's were last year - when Akinori Iwamura was playing in the US and Tsuyoshi Nishioka wasn't.) As usual, Katsuya Nomura, Choji Murata and Masaichi Kaneda are not in the set. Here's some sample cards. First, the front and back of Tatsuyuki Uemoto's card (#131) showing the outline of Yamaguchi on the back, followed by that cards of Norichika Aoki (#088), Tatsunori Hara (#011) and Tetsuharu Kawakami (#012), which is the only card in the set with a horizontal format. Hmm, maybe that's not the best title. I always learn useful things from Yakyu Baka - it's just that these things are baseball card related. - Calbee's first series for the year was originally scheduled to be released nation-wide on March 21, but it ended up getting delayed due to the earthquake. The cards are now being released in different areas on different dates - in Kansai starting this week and Hokkaido starting next week. 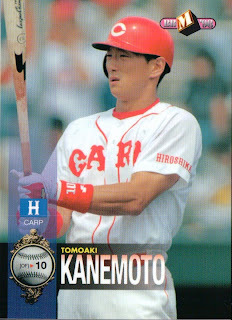 I don't think that BBM is delaying the release of any cards - I know that the Tokyo Big Six set was released last week and that the 1st Version set is coming out April 23. I think that those were their original release dates. 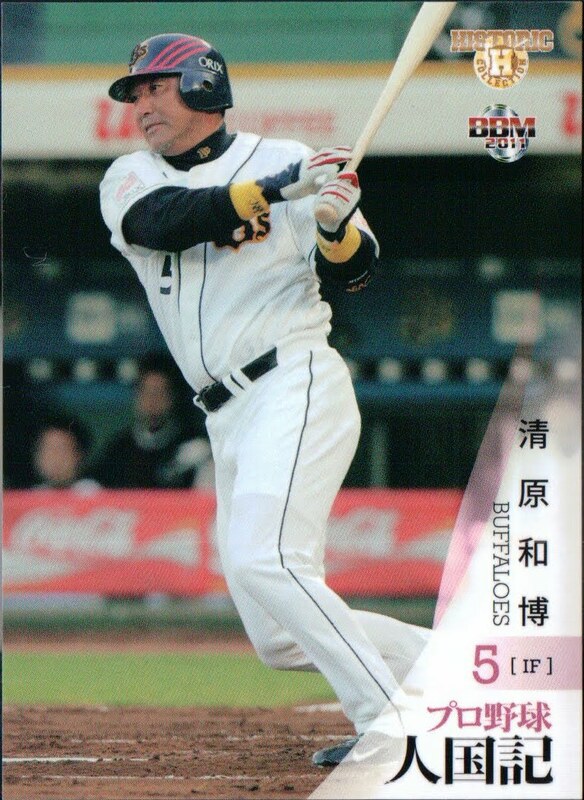 - It turns out that the new BBM set "Legend Of Bs 2011" is a tie-in to some games that Orix is playing this season where the Buffaloes will wear 1970's era uniforms for both Kintetsu and Hankyu. Kind of like the "Lions Classic" sets BBM has done in the last couple years. There's also a kind of cool website that ties in as well. 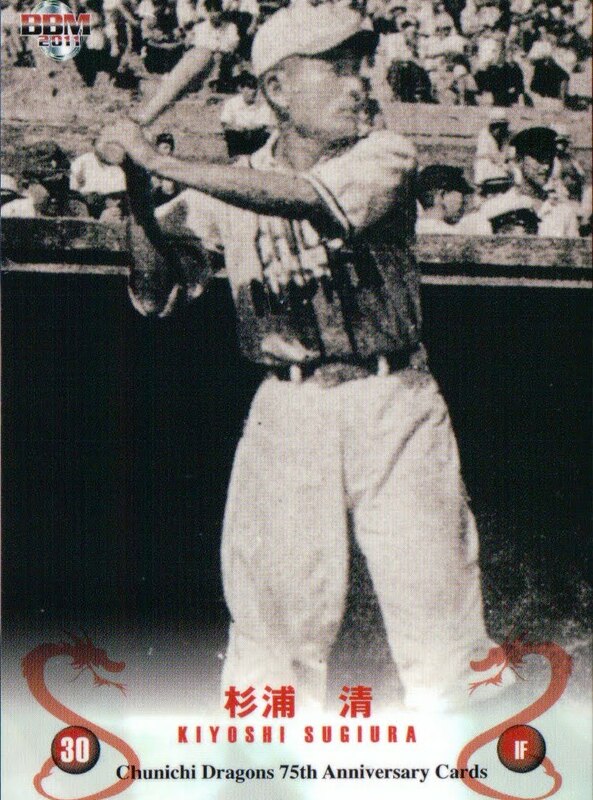 - Not baseball card related, but I found this interesting - the Pacific League has released a smart phone app. I downloaded it for my iPad last night and it's...ok. It's not going to make anyone forget about MLB's app. I've gotten it to either hang or crash twice now, so it's kind of buggy. Not being able to read Japanese is a handicap, although I can usually figure out where I'm navigating to, even if I can't read the articles. I mostly downloaded it for the videos, but they appear to be buried in the team sections and I've had mixed success being able to see them. But the app is free and hopefully it will improve. BBM announced today that they have obtained a license from MLB to produce cards for the US market for this season. Photographers from BBM spent the last couple weeks in Florida and Arizona taking pictures and the first set (called MLB 1st Version) will be released next week. The set will contain the full 40 man roster plus the manager and a checlklist card for each team. There also will be a 31 card subset for the statistical leaders from last season and a 60 card subset featuring the top two rookies for each team, for a total of 1351 cards in the set. There will also be insert sets for the Silver Slugger and Gold Glove winners from last year. 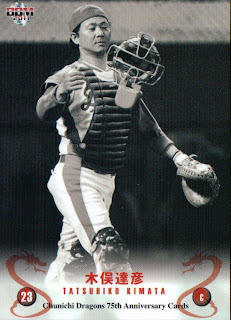 Plus in continuation of BBM celebrating their 20th anniversary producing cards, they will have a special parallel issue for all the cards that includes a piece of china embedded in them. And there will also be autographed Yuki Saitoh cards, serially numbered to 1988. Future sets will include MLB 2nd Version, which will include only 25 players per team, a 90 card 1st Version update and a subset featuring first pitch ceremonies from various ballparks (the size of this subset is dependent on how many swimsuit models BBM can arrange to throw out the first pitch) and MLB Touch The Game, a high end set to be printed on thin slices of platinum (they make an incredible sound when you put them in the spokes of your bicycle). There will be box sets for the All Star game and the World Series, a "Rookie Edition" set featuring every player drafted - 2400 cards to be released on August 16. BBM will also release a team set for each team that will feature every player, manager and coach in the team's organization - each set is expected to be roughly 200 cards.